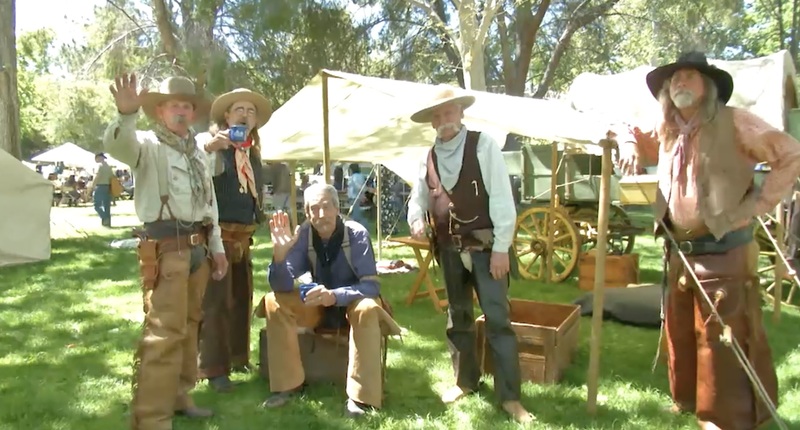 Thousands of cowpokes turned out for day one of the Santa Clarita Cowboy Festival on Saturday. From the famous peach cobbler to the live Western musicians, the festival drew cowboy-enthusiasts, families and more who enjoyed. The second day of the festival is on Sunday, April 14 from 10 a.m. to 6 p.m. and will feature a Chili Cook-off to raise funds for Bridge to Home. The sights, sounds, and swagger of Cowboy life will be on display all weekend and general admission tickets to the main festival at Hart Park are once again FREE for all visitors. In addition to the festival, separate ticketed tours and performances will be hosted by Rancho Camulos, Friends of Hart Park and the SCV Historical Society. The main festival at William S. Hart Park will feature performances across the five festival stages, as well as living history entertainers, food vendors, Western gear shopping and activities for all ages. New to the Cowboy Festival in 2019 is the Cowboy Cook-off, a BBQ competition on Saturday, April 13, and a Chili Cook-off on Sunday, April 14. A limited number of $100 VIP packages will also be available. Each package includes special access to the festival at William S. Hart Park event area, including weekend admission to the VIP Cantina area, which will provide food and beverages, VIP shuttle service to and from the festival and one piece of Cowboy Festival merchandise. The 2019 Cowboy Festival will feature favorite performers from festivals past, including Honey County and Kristyn Harris, as well as a slew of rockin’ newcomers, including Shannon Rae and 100 Proof and Dirty Cello. Prior to the Cowboy Festival, on Thursday, April 11, the Walk of Western Stars will unveil its 2019 inductees, commemorating their contributions to Western entertainment history by immortalizing their names in bronze and terrazzo tile, stamped into the streets of Old Town Newhall. More information about the 2019 inductees will be available in the coming weeks. The City of Santa Clarita is also looking for volunteers to staff the Cowboy Festival and is currently recruiting for festival greeters, activity helpers, ushers and more. To learn more about volunteering at the Santa Clarita Cowboy Festival, please contact Volunteer Engagement Program Supervisor Tess Simgen at (661) 250-3726. More details on the 2019 Santa Clarita Cowboy Festival, including performers, schedules and pricing for special events, will be made available at CowboyFestival.org in early February. been going for 16 years…its lost something. Peach Cobbler not the same and no beans, biscuits and gravy. No fry bread booth and no native american dancers. I left feeling really sad.